Fun Kitchen is hosted back by Infinite Organizer, a full-service event planning company who has passion and previous experiences in planning and coordination events, corporate event, exhibitions, and weddings. 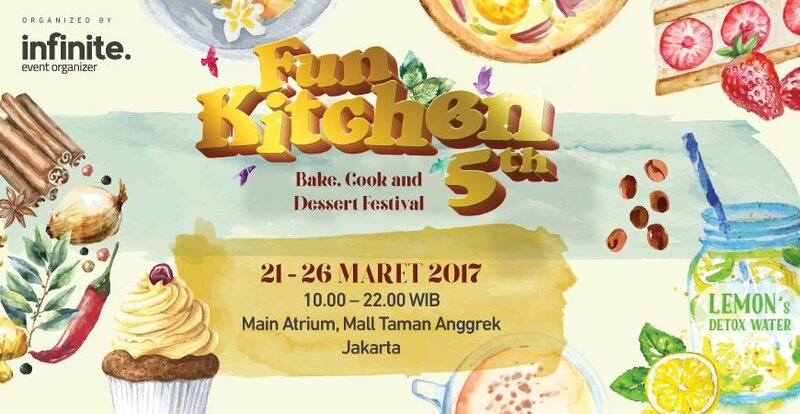 Repeating the success achieved in the previous year, this year, Fun Kitchen 5th will be held on 21st till 26th March 2017, at main atrium Mall Taman Anggrek, Jakarta. A week live event devoted to those who have passion on cook, bake and dessert. “Temukan Peluang Usaha Makanan & Minuman” becomes major focus of this annual event, because Fun Kitchen 5th provides numerous business opportunities to buyers and spoiling public visitors with mouth-watering delicacies. The whimsical atmosphere is definitely a great way to spend your weekend. With so much food and provisions to indulge in, visitors are sure to be spoilt for choices. Get expert advice from those in the know – our exhibitors will not only help visitors with time saving tools and products, but will share insights to make sure they get the most out of their projects on F&B. Free demonstrations will be running from stands throughout the show, covering everything from sugar craft skills to baking advice, plus there’s a host of interactive features from some of most trusted brands in the industry. While gratifying in good food and good value purchases, there will also be lots of entertainments and fun-filled stage activities. There is also a chance to participate on fun and educated competitions on F&B, workshops, and many more surprises.